The National Retail Federation’s ‘Big Show’ is always a show-stopper of an event and this year is no exception. 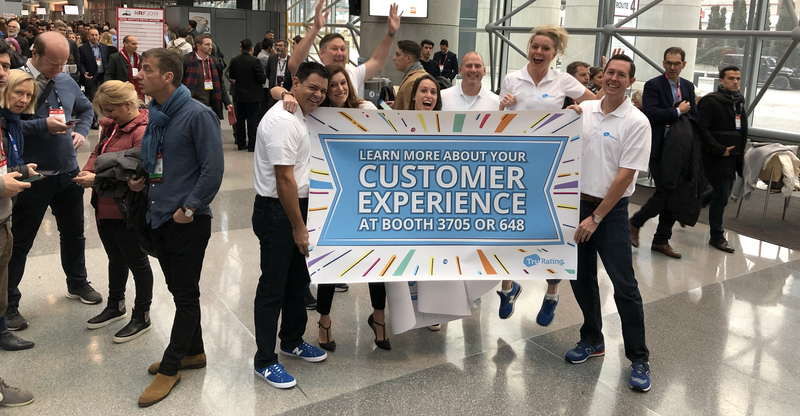 With over 30,000 delegates descending on New York’s Javits Centre over the course of its 3 days, the event is a major showcase for the retail tech trends of the year ahead – if it’s not being discussed at NRF, it’s probably not worth knowing about. With so many incredible speakers packed into the lineup, it’s hard to know where to jump in. To help you along the way, we’ve picked out the highlights from our favorite sessions so far. "Millennials don't have a low attention span, they just have a higher sensitivity to things which are boring"
When it comes to getting to the quick of the modern retail landscape, you can bet on Doug Stephens to deliver the goods. On the first day of NRF, Doug gave a valuable lesson to any retailer thinking about blaming the millennial attention span for their own failings. Millennials have been big news at NRF, but it’s clear that many retailers feel uncertain how to engage them. With a combined buying power of ‘over $200 Billion for Millenials and Gen Z’ (thanks @AliciaTillman) – it’s clear that getting this market right is going to be a critical concern for retailers for some time. 1. Start with the consumer in every decision. 3. Reinvest in stores, tech, fulfillment and your teams. Speaking to a packed room, Brian Cornell CEO and Board Chairman of Target delivered a brilliant opening to Day 2. With a strong customer-centric philosophy, Cornell made a passionate case for the importance of Target’s physical estate, explaining how much of the success of its digital business has been down to the fulfillment capabilities provided by their traditional bricks and mortar locations. An impressive case study for how digital and off-line can be mutually beneficial when done right. As the CTO of luxury fashion brand Tory Burch, John Douglas (previously CTO at Burberry) is used to customers with high expectations. In a world of ever-increasing competition, Douglas put forward a strong argument for the necessity of an exceptional Customer Experience. Philanthropy lies at the heart of the Tory Burch model, and Douglas reminded us that Customer Experience (or CX) can be more than about just product: “the world is a better place if we have big ambitions for ourselves and others.” The combination of excellent service with strong brand values has given Tory Burch a unique position in a difficult marketplace. 5. “We’re on a journey not to be a good company, but a great company.” Marvin Ellison, CEO Lowes. Closing out Day 2, Mavin Ellison of Lowes delivered a fantastic key note on ‘Fortunes in the Fundamentals’. Ellison delivered a strong statement of intent for Lowes, and echoing a familiar sentiment, made an impassioned case for setting greatness as your goal, and not just settling for good enough. An inspiring end to a packed day. We’ll be back with our final round up once Day 3 is all wrapped up, but in the meantime, enjoy the last few hours of Retail’s Big Show!